Slot games of today are characterised by a lot of bonus features and immersive design. For some people, this constant bombardment of the senses could be quite overwhelming. People in this camp would greatly appreciate a slot game that is simple in its design and involves basic gameplay. In addition, it would be an added advantage if the slot game offers a quality opportunity to come out with large earnings. Thankfully, Blueprint Gaming has come out with a slot game that perfectly fits this little range of specification. This slots game is none other than Winstar. Read on to discover what this slot has to offer. Blueprint Gaming is relatively new in the world of online slot game development. Although this slot developer is quite new, it is a subsidiary of an established veteran – the Gauselmann Group. This group has been established since 1957 and engages in the manufacture and supply of gaming machines. Considering its field of operation, it is only natural for Gauselmann Group to diversify into the world of online casino gaming. This diversification is responsible for the establishment of Blueprint Gaming. Blueprint Gaming has established offices in the United States, the United Kingdom, and the Philippines. Although Blueprint Gaming is quite new, it has developed a host of awesome slot games. 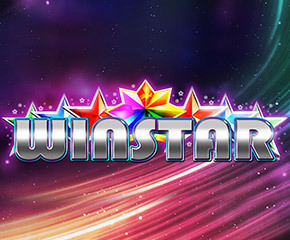 There is no doubt that this present game, Winstar, is one of the wonderful games from the works of Blueprint Gaming. Winstar slots have 5 rows and 20 paylines. It is one with a simple and straightforward design. It also offers straightforward traditional gameplay with a progressive jackpot. The game has a minimum bet of £0.20 and a maximum of £500. The symbols in this game are the standard slot symbols from Ace to 10. In addition to this, we have stars in a wide range of colours. To get a win in this game, the symbol needs to appear 3 or more times on the reels. However, unlike other games, the symbols do not have to appear in a certain order. Anywhere the symbols appear on the reels in the required quantity would lead to a win. The symbol with the highest value is the silver star. If this icon appears thrice on the reels, it pays out 10x, four landings pay out 30x while five landings pay out 50x. Winstar slots also offer players a progressive jackpot. Activating this jackpot is not tied to the appearance of any of the symbols. While the game is going on, the reels have a golden line around their edges. If the golden lines appear on all the reels, the jackpot has been activated. When this occurs, you have a whopping 500x your stake. 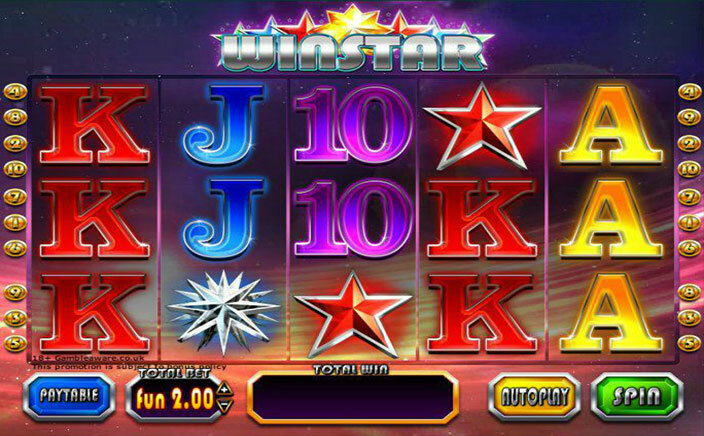 Winstar slots don’t offer much in terms of stunning graphics and extra features. What it lacks in this regard it makes up for in generous pay-outs. If you are looking for an opportunity to get away from all the distractions inherent in slot games, then this slot is for you.